Triloka Premium Incense is handmade according to ancient tradition in India - supporting an age-old cottage industry. It is purely an art - blending over 20 natural ingredients per fragrance to create an enriching line of Incense. Each Triloka Premium Incense stick is individually handrolled using only the finest herbs, gums, essential oils, charcoal, Mysore sandalwood and other pure and natural ingredients. Never any dipping! 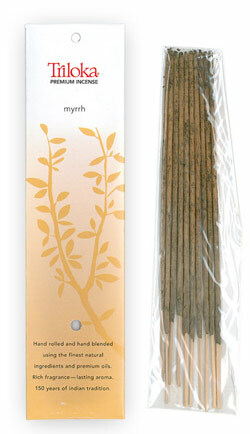 Triloka incense will release fragrance even after years of storage because of its pure and rare ingredients. For meditation, relaxation as a mood enhancer, or as a natural air freshener.